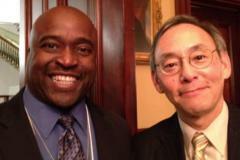 Dean Gregory N. Washington, Ph.D., The Henry Samueli School of Engineering, was one of over 40 engineering school deans invited to attend a White House event to celebrate the efforts of engineering deans for their commitment to retain and graduate more students in the field of engineering. This event was part of a public-private initiative by the President’s Council on Jobs and Competitiveness (Jobs Council) to address the nation’s shortage of engineers. The goal is to yield 10,000 more engineering graduates in the United States annually. A Seal of Excellence will reward engineering colleges that produce more graduates and provide an incentive to others. The Jobs Council hopes to encourage students to remain in engineering by increasing the number of internships available and by funding direct incentives for engineering students. President Barack Obama greeted the roomful of engineering deans on February 8 with a pledge to “use the bully pulpit to emphasize how important your work is” and an assurance that “everyone in this administration is four-square behind you. America has always been about innovation and has an incredible diversity of talent out there waiting to be tapped.” Also in attendance were Secretary of Education Arne Duncan, Secretary of Energy Steven Chu, presidential science adviser John Holdren, National Science Foundation Director Subra Suresh, senior adviser Valerie Jarrett and chairman of the President’s Council of Economic Advisers Alan Krueger. Paul S. Ottelini, chief executive officer of Intel Corporation, said the private sector has raised $20 million toward the effort and promised to hire 7,000 first- and second-year engineering undergraduates as summer interns. The Jobs Council announced that over 60 industry leaders have committed to doubling the engineering internships available at their companies. A few of the companies that made the pledge include The Boeing Company; AT&T Inc.; Facebook Inc.; American Express Company; E. I. du Pont de Nemours and Company; Dell, Inc.; and Sprint Nextel Corporation. Chu encouraged the deans to concentrate on research and education that will bolster a renaissance in manufacturing, and said funding from the Department of Energy can help. He cited “huge opportunities in power electronics” as well as high-strength steels, and predicted “a golden age in materials and materials manufacturing."